Museum of armoured vehicles Smržovka represents the largest private tank collection in the middle Europe. In addition to tanks, numerous pieces of other military vehicles and artillery can be found among its exhibits as well. Situated in former halls used for agricultural equipment in the northern part of the Czech Republic, the local surroundings allow unforgettable tank-rides and reenactment demonstrations. Besides the popular line of post-war Czechoslovakian tanks built under Soviet licence (such as T-34/85, T-55, T-72 and other), the museum also owns a plenty of WWII machines – British tanks Comet, 2 pieces of Cromwell, American M-36 Jackson, Stuart M3A1, Soviet IS-2 and a great number of wheeled and half-track vehicles, especially of American production. You may also find there a fully running British Centurion tank, French AMX-13, etc. Concerning the extensive artillery collection, among many others, a famous German Flak-88mm is worth mentioning. 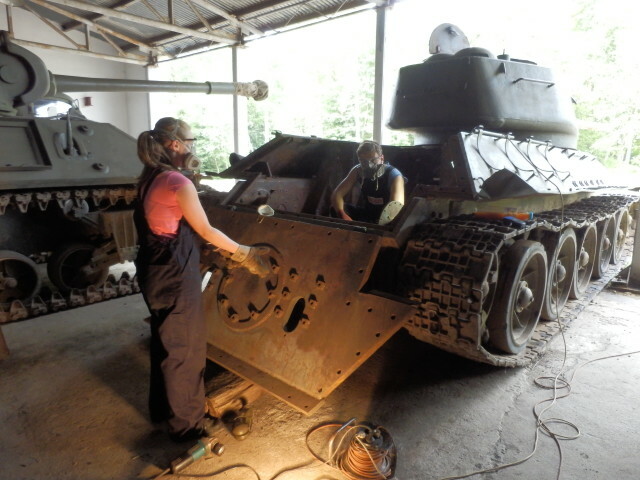 A fully equipped workshop is at the museum’s disposal so that workers can resurrect and transform old tanks and vehicles back into its long-time fame and shine. 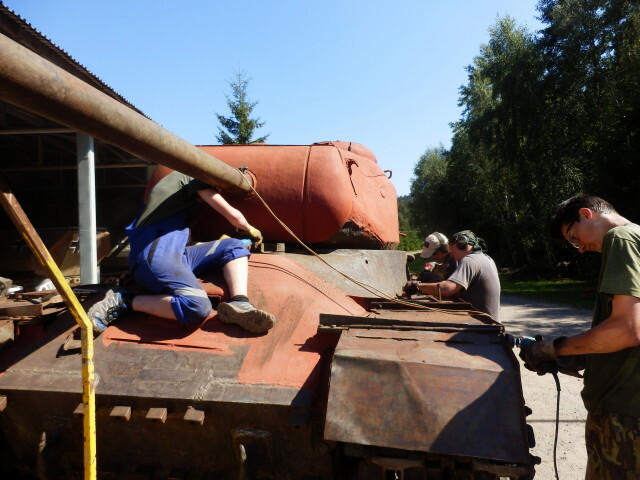 Museum plans a lot of restoration projects, however, due to the fact of being private with no regular employees, you can imagine how long it takes to completely restore rusty tanks into final running condition. Working process takes place only during the weekends; the work is done only by the owner and his 2-3 friends or family members. 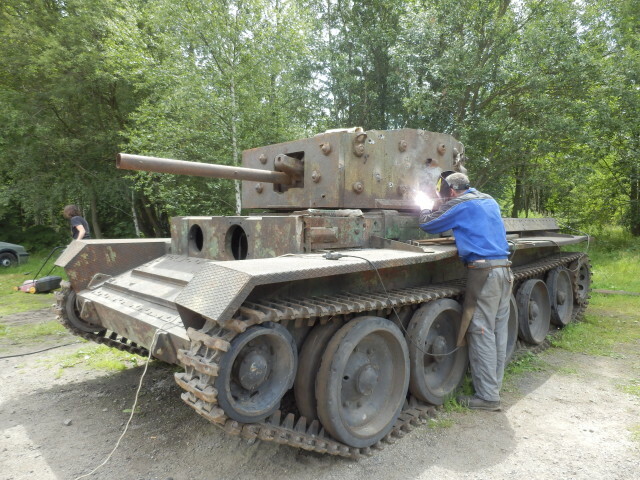 We had already been told by many visitors that they would gladly help us with restorations. Having said that, an idea of possible volunteering aid settled in our mind. As the time was going by, the idea got its shape and was ready to be implemented. In April 2015, we decided to get it started. An advertisement was put on Facebook, introducing the whole project and encouraging people to enrol. Nobody had expected what came soon afterwards – a huge success and we had to stop the enlisting process thanks to a huge number of applicants after several weeks. The volunteering itself was commenced on 1st of June 2015 and lasted every day until 31st of August (except a very few days off, for which we were really grateful so that we could catch on breath again). Regarding the volunteers, almost 70 came from all over the Czech Republic, a small number from Slovakia and even one from France! Men and women, of all professions, ranging from 15 to 50 of age, all came to us for a good cause. 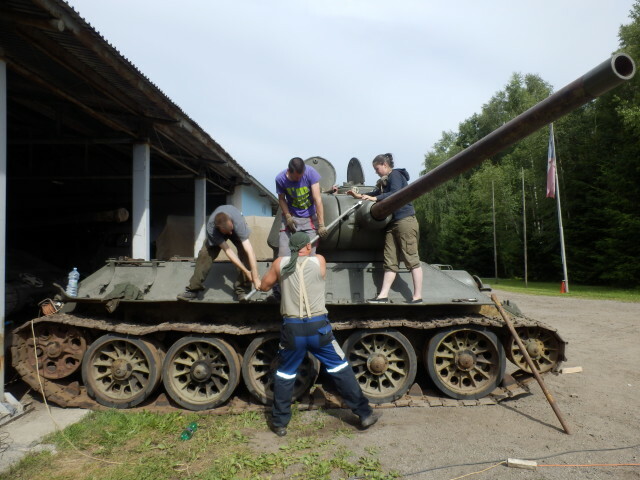 No wage was given to them, but a tank ride and a t-shirt with the museum logo was their earned and welcomed reward (along with accommodation and lunch)! 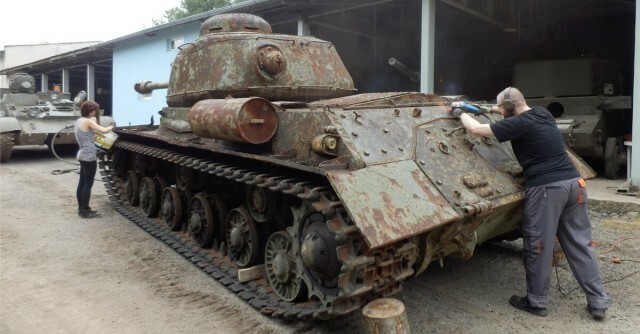 The work consisted of various phases and focus – repairing tanks like the T-34, Charioteer, Comet, Cromwell, IS-2 and what was needed at that time. We had to take into account the gender – girls performed mostly cleaning and painting, men sandblasting, cutting, welding or specialised technical works. Even though the outside heat was often unbearable, everyone did pretty well. No matter how old and experienced they were, everyone taught and tried some new things. Furthermore, new friendships have arisen and many those people intend to come back for the summer volunteering 2016.